The Bible is the most complete, but not the only source of historical data. The existence of Jesus as a real person is well documented in sources outside the Bible. The biblical accounts agree with evidence from secular and Jewish historians from the first two centuries A.D.
“[Nero] falsely charged with the guilt, and punished with the most exquisite tortures, the persons commonly called Christians, who were hated for their enormities. Christus [a common misspelling], the founder of the name, was put to death by Pontius Pilate, procurator of Judea on the reign of Tiberius; but the pernicious superstition, repressed for a time, broke out again, not only through Judea, where the mischief originated, but through the city of Rome also.” (Annals XV,44). 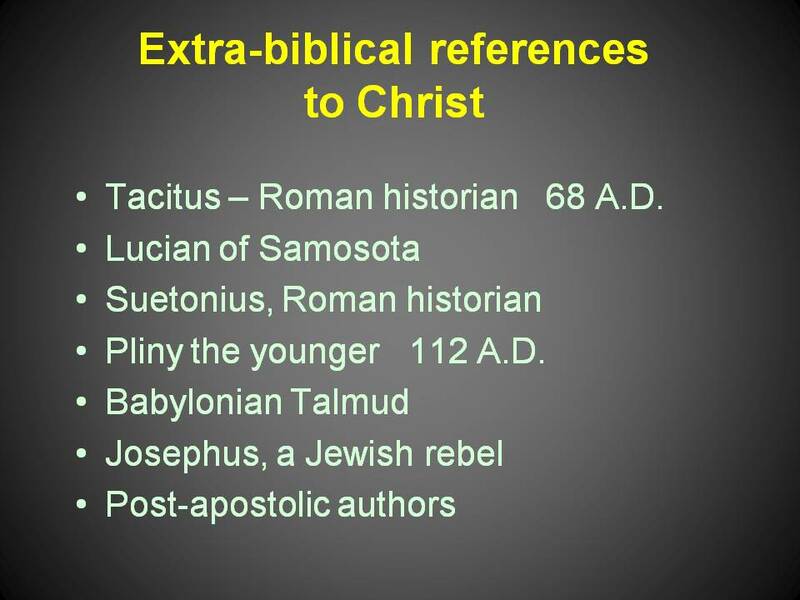 The Babylonia Talmud, a Jewish commentary on the Hebrew Scriptures (Old Testament), probably completed in the 6th century A.D., states: “On the eve of Passover they hanged Yeshu* [a Jewish version of Jesus’ name]. And an announcer went out in front of him for forty days, saying: ‘He is going to be stoned, because he practised sorcery and enticed and led Israel astray. Anyone who knows anything in his favor, let him come and plead in his behalf.’ But not having found anything in his favor, they hanged him on the eve of Passover.” This account from a hostile source contains interesting information: they attribute his miracles to sorcery, that he lead many astray from their teachings, that he was tried but no one spoke in his favor, and that he was hanged [Jewish description of crucifixion] on the eve of Passover. Flavius Josephus, a Jewish rebel captured by the Romans in A.D. 67 before the fall of Jerusalem, wrote about Jesus in his Jewish Antiquities, XVIII, 33: “About this time there lived Jesus, a wise man, [if indeed it is lawful to call him a man,] for he was a performer of wonderful deeds, a teacher of such men as are happy to accept the truth. He won over many of the Jews and many of the Gentiles. [He was the Christ, and] when Pilate, at the suggestion of the leading men among us, had condemned him to the cross, those who had loved him at the first did not forsake him; [for he appeared to them alive again on the third day, as the prophets of God had foretold these and ten thousand other wonders about him.] And the tribe of Christians, so named from him, are not extinct to this day.” Quite likely the phrases in brackets are later additions, but even without these, Josephus confirms that Jesus existed, was a teacher, did miracles, died on the cross, and his followers continued on. Of course there are many references to him in the Post-apostolic writers, also called “church fathers,” the early leaders and writers of the church immediately after the age of the apostles. Many discount these writings as mere repetitions of the earlier accounts and thus hearsay evidence. However, they do serve other purposes, such as showing that the Gospel accounts were already in use at a very early date and believed to be reliable. This is an excellent summary! Thank you for putting this up.